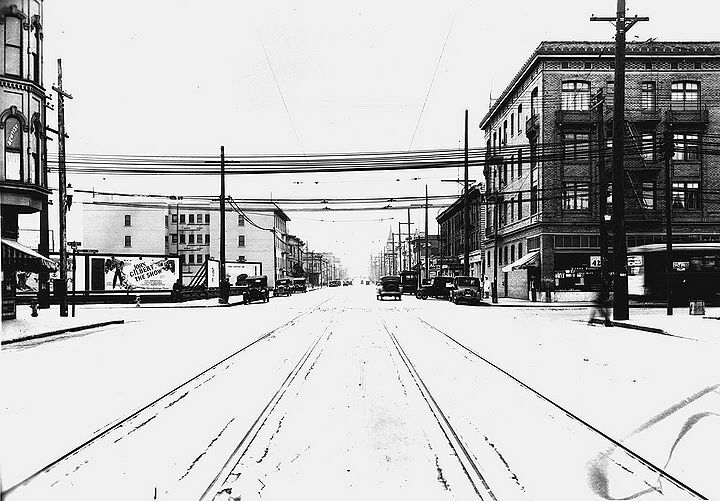 Howard Street (now South Van Ness) at 16th, 1929. The place of my birth was a flat on Howard and 23rd Streets. Howard Street, today, from 13th Street to Army Street is known as Van Ness Avenue South. To me it will always be Howard Street. This unfortunate change of name occurred by resolution of the Board of Supervisors on August 22, 1932. The building still stands, a splendid example of what we of this day are pleased to call Victorian architecture. It is three stories in height with a store at street level. Like all Victorians, the seven-room flat had ceilings at least ten feet from the floor. In addition there was a huge back porch and steps that ran from the porch, zig-zag, to street level. The building rested on an extensive lot and was the recipient of morning and afternoon sunshine. Directly above the store was the flat in which I was born. The seven rooms of the flat consisted of a parlor (there were no such rooms as living rooms in that day and age), a dining room, a large pantry and a kitchen where my grandmother, Catherine McDonnell, cooked on a wood and coal stove. The rest of the rooms were bedrooms. Records of the San Francisco Water Department reveal that water service was installed in the store on September 3, 1885 and in the flats in 1891. Because the building was erected prior to the Earthquake and Fire of 1906, the records of its date of construction no longer exist. I have no idea of the age of the building but it is reasonable to assume that it is over the century mark. With the exception of the old wooden awning fronting the store having been moved, the building is much the same in appearance as when I was a child. 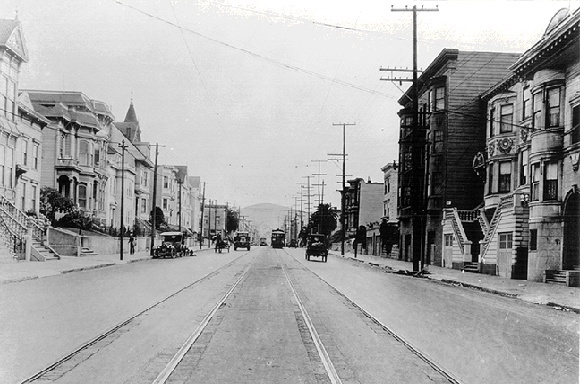 Howard (now South Van Ness) at approximately 18th Street in 1905 looking south to Bernal Heights. Howard Street, and for that matter, a great many streets in the Mission District, was once an avenue of well-to-do families. I recall skipping on and off carriage blocks placed at curbs in front of homes, a reminder of the days when ladies and gentlemen would enter or leave horse-drawn carriages by using such blocks as stepping stones. Many of these blocks had carved on them the names of the families who dwelt in the homes before which the blocks rested. Before the prevalence of the automobile homes were fronted by gardens protected from intrusion by iron or wooden picket fences. It was great sport for us children to run down the sidewalk with an outstretched stick in our hand striking the pickets. The resulting rat-tat-tat was a rhythmic beat that delighted us.